So, having had no takers on the invitation to climb Buckman Mesa, and having gotten an email reminder of the mineral and gem show in Albuquerque, I decided I’d take today to go to the mineral and gem show and visit some interesting spots along the way. 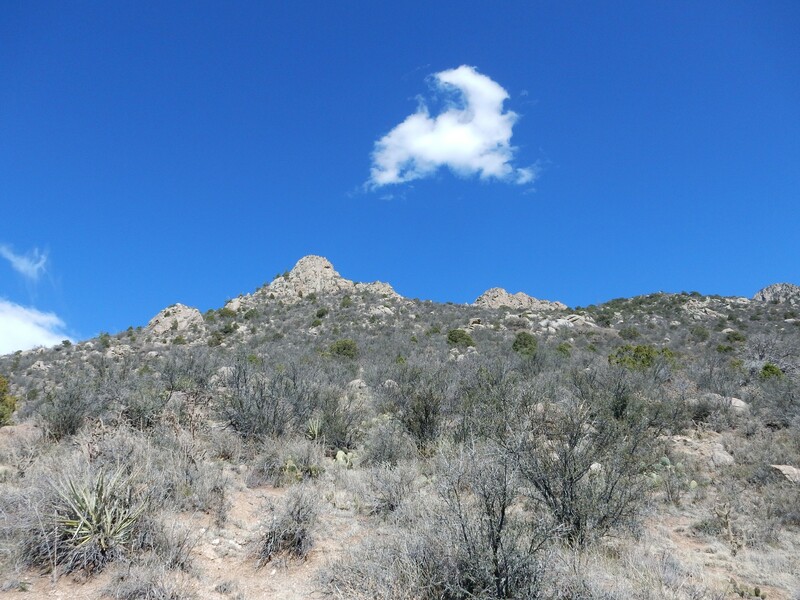 I figured I could do a reconnaissance-in-force on the orbicular granite outcropping above the La Luz Trail, then maybe reconnoiter the Placitas area, and perhaps find time to get some photographs of the Sierra Ladrones Formation in the Cochiti area. So I ate breakfast, packed my stuff, and headed on out, after leaving a flight plan for Cindy. I found the cell phone completely discharged; well, shucks. I could not find the charger, and I had no time to charge it anyway. I finally used my camera cable (it’s compatible, by lucky coincidence) and the USB adapter in my car to charge while driving down. The first part of the trip was familiar country. The adventure began when I turned off I-25 towards Cochiti and decided a panorama was in order. 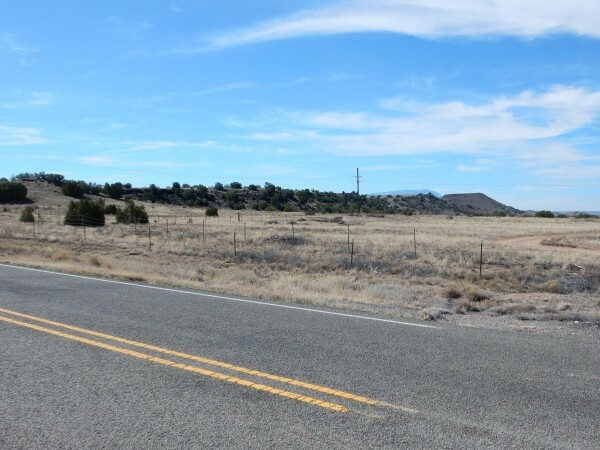 The extremely flat ground on which this road runs is La Majada (“Sheepfold”) Mesa. 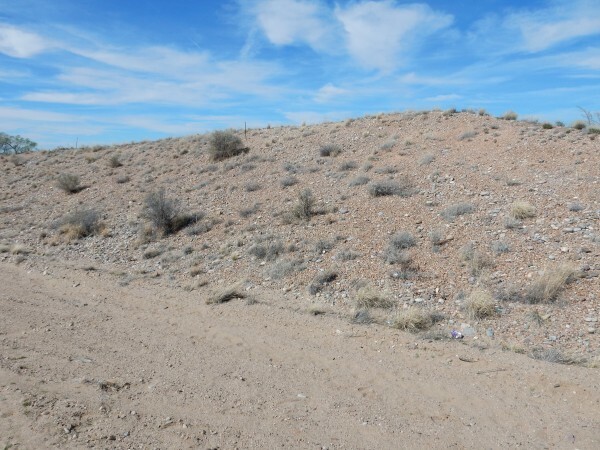 It is an almost perfect example of a geomorphic surface, a flat plain formed by the combined action of the Santa Fe River, Galisteo Creek, and possibly the Rio Grande, which beveled off the high ground and filled the lower spots with sediments. 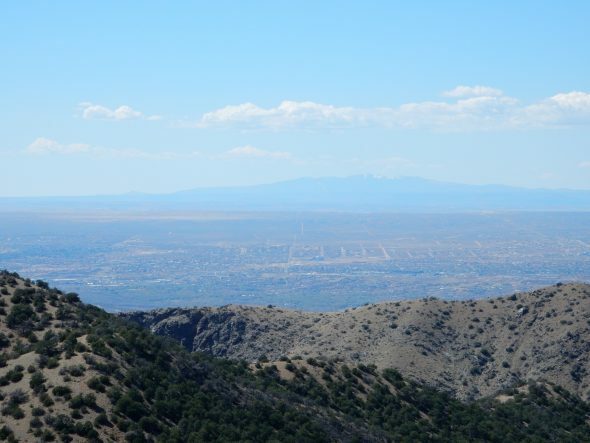 At far left is Sandia Crest, at left center is Santa Ana Mesa, and at right center is the southern Jemez Mountains. 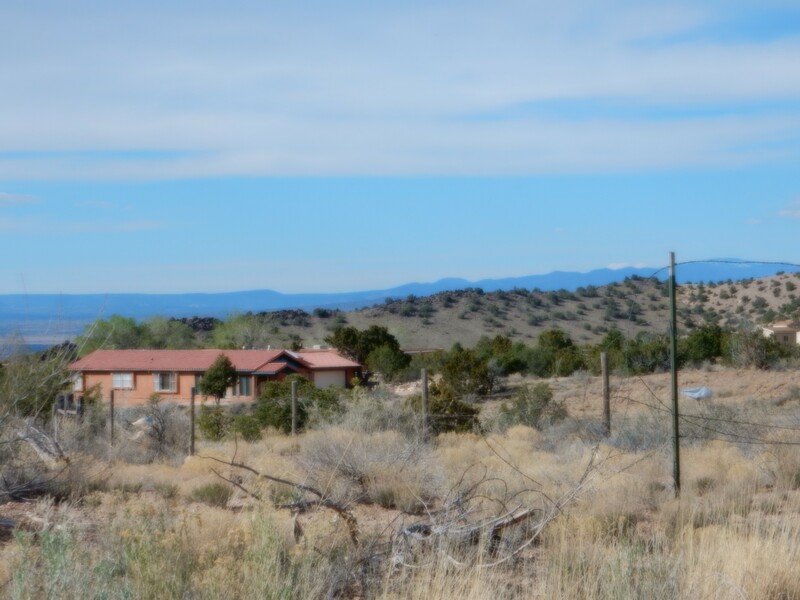 At far right is La Bajada, an escarpment formed by a major fault, the La Bajada Fault. White layered beds of the Abiquiu Formation are visible in the escarpment. 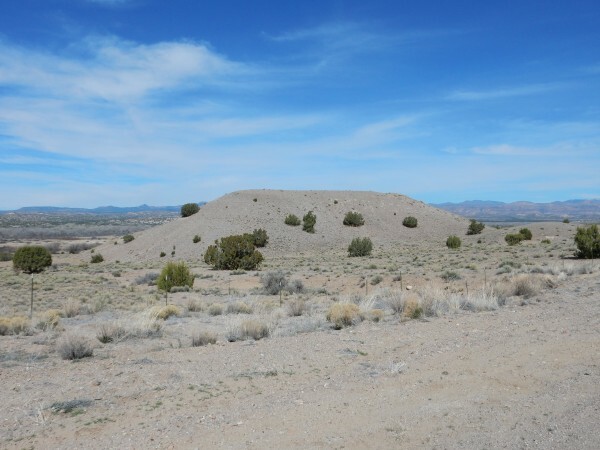 I had learned from a New Mexico Geological Society conference paper that there is actually a small uranium mine in this area, abandoned many years ago. I decided that was one for the book and looked for the turn. 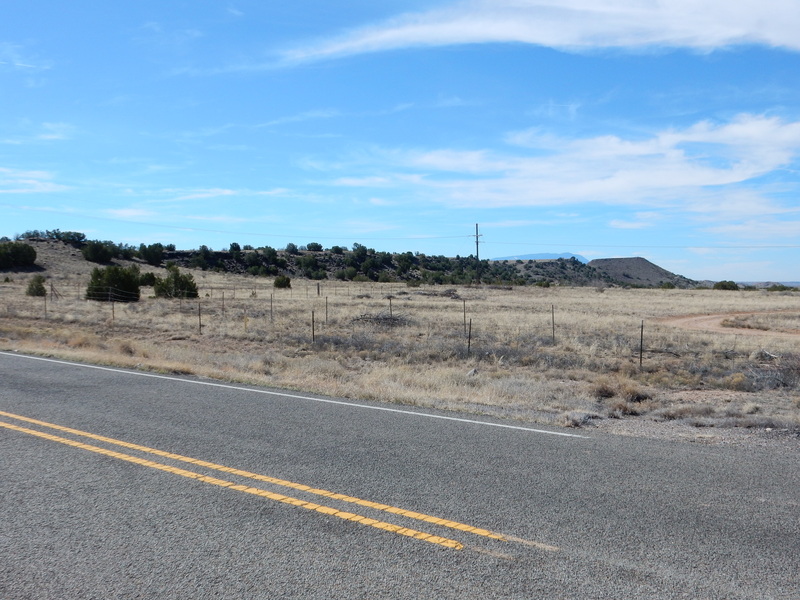 The view of the southern Jemez from this road was impressive, but there was a line of telephone poles in the way, so I held off on another panorama. I passed what I took to be the turnoff to the uranium mine, which had a locked gate (which, really, didn’t surprise me.) (Turns out there’s another route, which I did not get as far as. Might try it another time, though I’ll bet it’s gated, too.) By the time I got past the telephone poles, the road had sunk to where I could no longer get a good view of the mountains. Well, shucks. Not to worry. 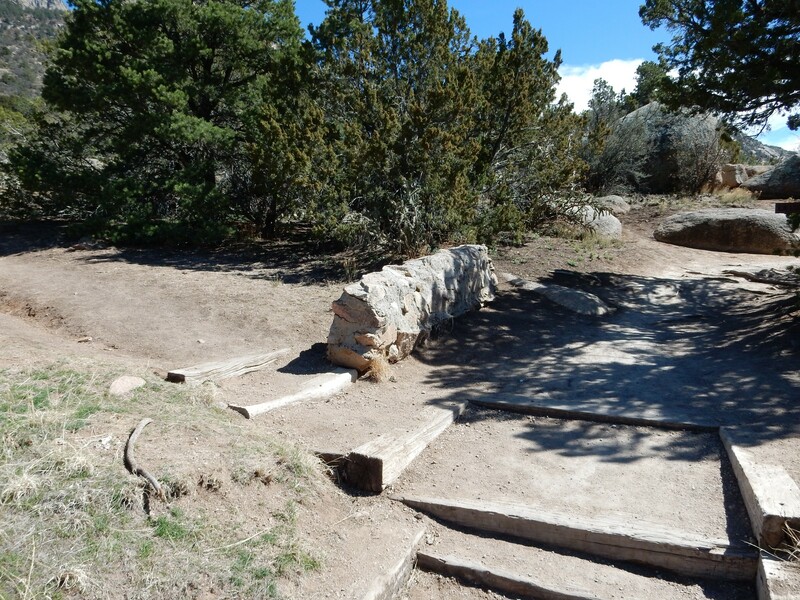 There was another choice spot further down, and I got a quite nice panorama of the southern Jemez. Lots of features in the full resolution version (click to enlarge) and I can’t identify them all; the southern Jemez is the most inaccessible part of the range and I’ve only poked around its edges in my wanderlusting. But the northern part of Santa Ana Mesa is at left; the sharp peak about a third of the way to the right is, I’m guessing, Cerro Ruiz; to its left is Tres Cerros and then the back side of Borrego Mesa; to its right are Peralta Ridge and Aspen Ridge, with the Tent Rocks area almost dead center and the top of Redondo Peak further right with snowfield still visible. Then comes the San Miguel Mountains, with the Sierra de los Valles beyond to their right. Further down, the road came over a ridge, giving the best view yet. Alas, the shoulder of the road was too steep to set up my tripod; I tried a pan by hand. This meant I did not dare use as much zoom. I dunno. Which do you like better? 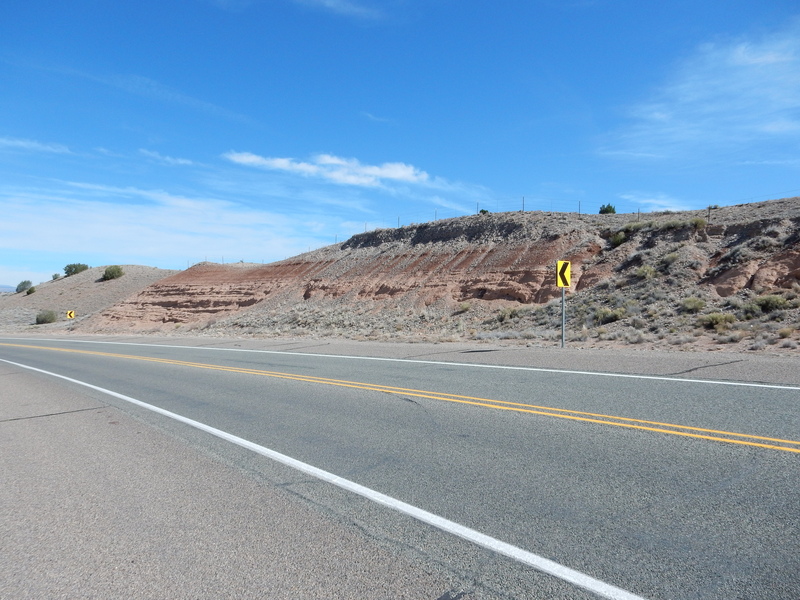 I paused near Cochiti Middle School for a photo that explains how the La Majada surface was so well preserved here. The cliff south of the school is basalt, with an age around 2.7 million years. This is interbedded with the Sierra Ladrones Formation, which in turn underlies the La Majada surface. 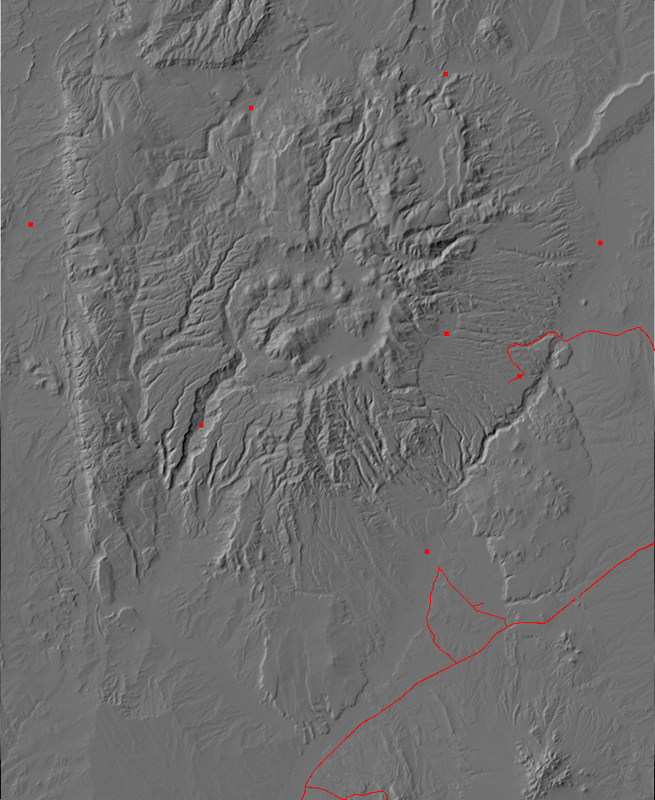 The hard basalt at the edge of the plateau helped prevent it from becoming deeply eroded. I turned south towards Pena Blanca and found myself looking at a nice roadcut. 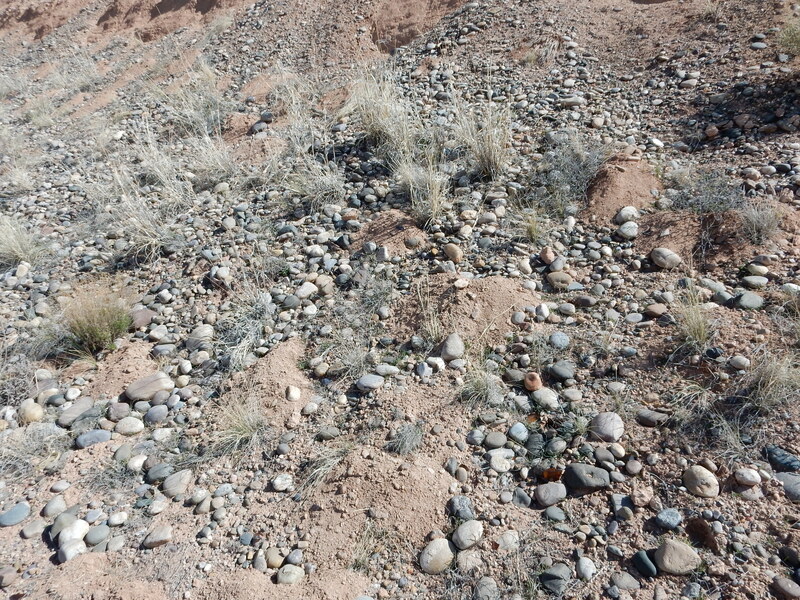 This is a relatively young gravel deposit, laid down by the Rio Grande perhaps 170,000 years ago, based on its similarity to the Edith Gravel of Albuquerque and gravel beds in the Espanola area. I drove on through the little town of Pena Blanca and into an area with excellent outcrops of the Sierra Ladrones Formation. 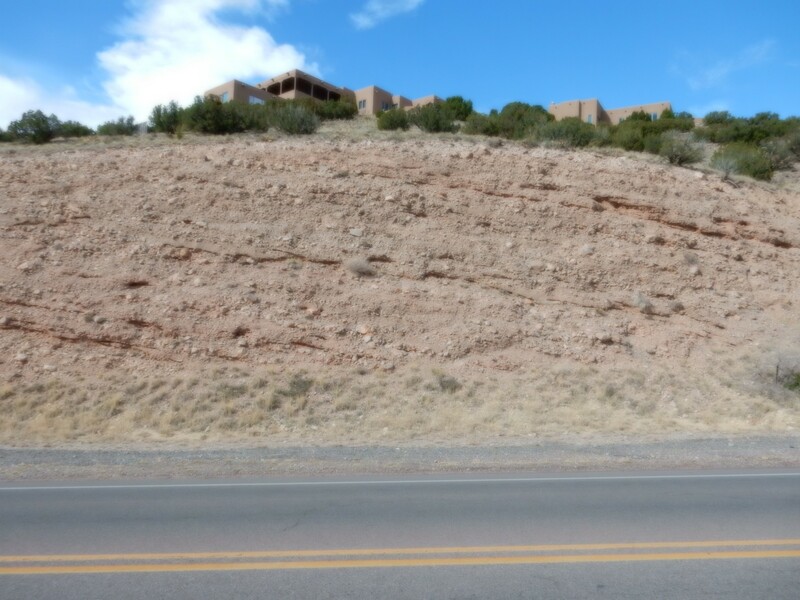 This is a formation of the Santa Fe Group, which includes all the rift-fill sediments of the Rio Grande Rift. The Sierra Ladrones Formation is a relatively young member of the group. This photograph shows the sandstone facies of the formation. A facies is rock of a particular character within a formation. Here a fault has thrown up a hill of the underlying axial gravel facies of the formation. The San Francisco Fault passes through the notch at left. The terrain on the near side of the notch is more of the sandstone facies, while the hill on the other side is the axial gravel facies. Axial gravel is laid down in the central channel of a river, in this case the Rio Grande. These beds are difficult to date precisely but cannot be older than about 6.5 million years or much younger than 1.6 million years, based on the ages of the individual rock fragments deposited as gravel in the formation and its relation with volcanic formations in the area. Further down the road, a very pretty road cut. 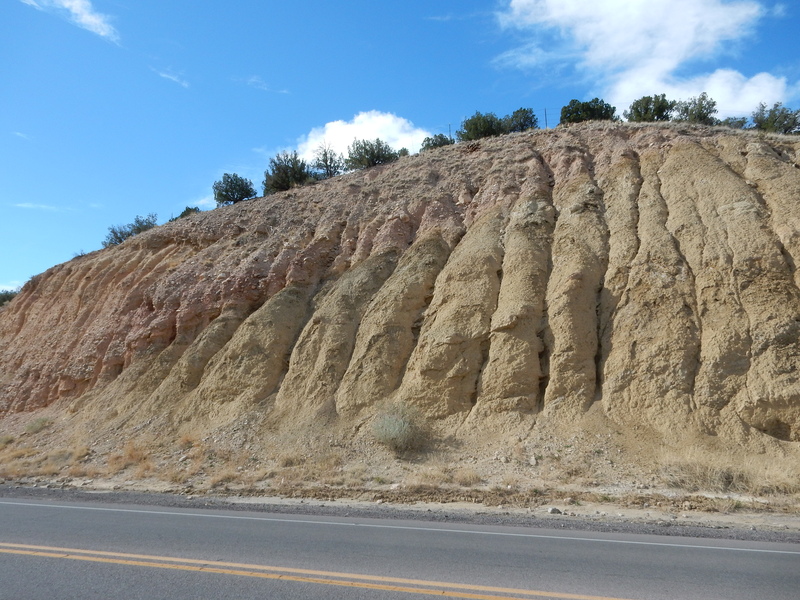 The nicely bedded red sediments are the piedmont facies of the Sierra Ladrones Formation. This is sediment brought in by the Santa Fe River and Galisteo Creek from the east. According to the geologic map, east of this spot, this facies contains abundant fossils of early horses (Equus) and ancient relatives of elephants (Gomphotherium). 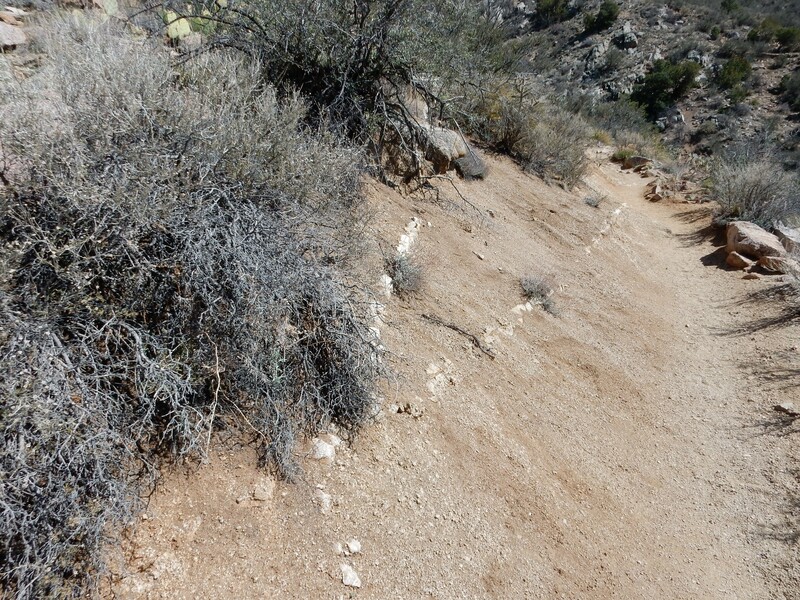 The gravel on top is relatively young alluvial gravel. The lower portions of the gravel contain volcanic ash that has been traced to the Lava Creek eruption of the Yellowstone caldera, 630,000 years ago, and presumably this gravel is about that age. The gravel itself contains a mix of quartzite clasts, probably Precambrian quartzite from the Tusas Mountains to the north, and basalt clasts, likely from the Cerros del Rio southeast of White Rock. This means this gravel was brought in by the Rio Grande. From here I headed on to Albuquerque and the gem and mineral show. I found I had to pay $5 for parking in addition to my $1 for the show. The show itself was a bit of a disappointment; it had much of the feel of a gem trade show, with many of the tables devoted to unmounted gems, and not that much in the way of spectacular mineral samples. Also, while there were things for sale I was interested in, and things for sale I could afford, the two sets were pretty much disjoint except at the book table for the New Mexico Geological Society. So I settled for a conference and guide book for the Tusas Mountains and made my exit, feeling somewhat humbled. Pardon a bit of a reflective digression. My father was raised on a cattle ranch in Idaho; my mother in a carpenter’s family in the same small town as my dad. Both were children of the Depression, and, while they were better off than some people (they never shared the kinds of horror stories of poverty that I heard from some of my friend’s parents) they were raised in homes where money was a valuable resource to be husbanded. My father was turned into a radar technician by the Army and ended up making a career of electrical engineering, and my mother was trained as a schoolteacher, and we were reasonably comfortable growing up; but my parent remained solidly middle class, to their bones. I have never really been comfortable in more affluent circles, with all the money that money can buy. It’s not that I have any particular dislike for rich people. I understand that economies are not zero-sum games and that the prosperity of some does not actually depend on the poverty of others. But I have never felt entirely at home outside the middle class. And I feel a little … squirrelly, I guess … among people who can contemplate spending $100 for a cluster of stibnite crystals or $450 for a giant trilobite fossil or $200 for a mastodon tooth. Because I find all these things cool, but wouldn’t seriously consider spending that kind of money for them. So perhaps gem and mineral shows are not really my thing. Also, I am enough of a newbie when it comes to these kinds of shows to feel like I don’t know all the etiquette, and something in my gut suggested it might be bad form to photograph the more interesting tables of minerals and gems. So I have no photographs to post. I headed on to the Golden Corral for a lunch buffet; to my surprise, they were still serving the breakfast buffet instead of steak, and to my greater surprise, they were not serving corned beef with cabbage. No matter; I like scrambled eggs and bacon just fine. 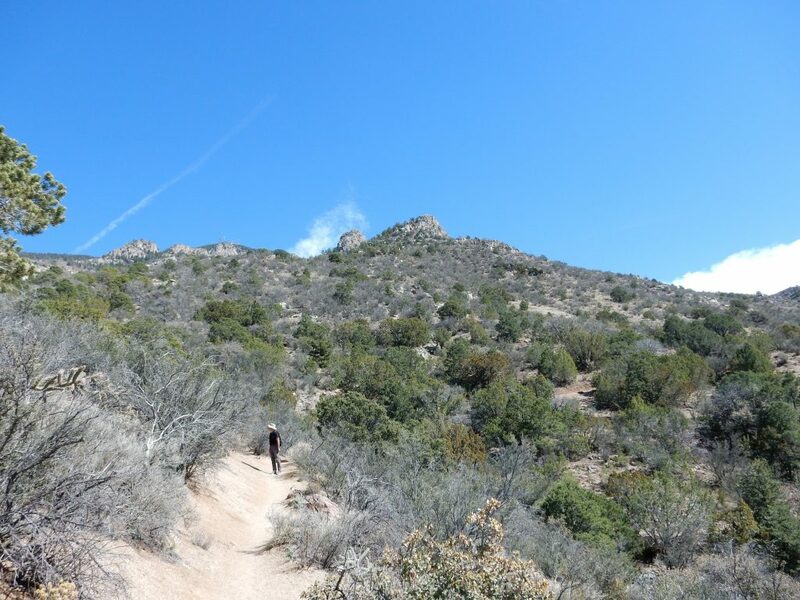 Then off to the La Luz Trail trailhead. This took some effort to find; and when I did finally get to the right spot, I found that the trail itself was a bit schizophrenic. There was a sign seeming to indicate right, but the stairs to the left were awfully inviting. My guess is the two eventually meet up anyway. I chose right, and this seemed to work. My objective was an outcrop of orbicular granite, close to the top of a high knobby ridge. The map showed that the trail passed reasonably close below the ridge at one point, and I thought it might be possible to bushwack from there. So this hike was a kind of reconnaissance-in-force: If the effort required was not too great, it would be way cool to get to the outcrop, but this was not a hill I was prepared to die on. There was a wonderful spot a little ways up the trail for a panorama. Sandia Crest is underlain by granitoid rock, mostly quartz monzonite. The prominent ridge on the right side of the photograph, which forms a kind of northwestern range of foothills, is composed of metamorphic rock thrown up by a fault lying along the valley between the two, the Jara Fault. The ridge at far left, in turn, forms the south rim of a canyon following the La Cueva Fault Zone; the La Luz Trail runs along the north side of this canyon. A nice distant view of Mount Taylor. Some nice pegmatite veins weathered into relief along the trail. This is a popular trail, and I found the demographics of my fellow hikers intriguing. It was all either older men like myself or college-age girls. I headed on back down the trail, pausing again for another panorama. Then back to my car, after a brief conversation with a fellow who seemed vastly amused that a couple of the college-aged girls had ensconced themselves on a nearby high hill and were checking out the environs, presumably including the two of us in the parking area, with binoculars. I know: You are thinking I need to work a little on my focus. Actually, the problem was that I had inadvertently switched to the special effects preset on my camera, which was set to soft focus. Several other of my photographs ended up spoiled the same way; fortunately, not all, including some that were meant for the book. I stopped again almost immediately for another shot, because there was a contact here that was not to be missed. And this shot was with the normal setting. I guessed at the time that this was a contact between piedmont gravels and Cretaceous beds, probably Mancos Shale. And, when I got home and checked the geologic map, I found that I was right. 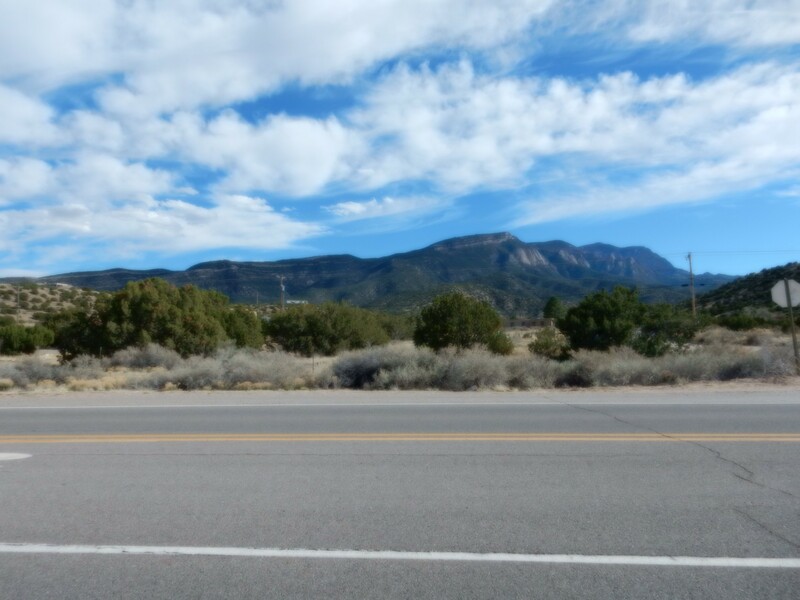 The ridge is the Crest of Montezuma, a block of crust thrown up by faulting north of Sandia Crest. This exposes a wonderful Carboniferous section. The hill I’m standing on, the terrain in the foreground, and the reddish beds at bottom center of the ridge are all Permian Abo Formation, deposited by rivers and streams some 200 million years ago. A fault runs between these Abo beds and the ridge itself. At left, at the base of the ridge, are darker beds of Precambrian rock. Immediately above these, and forming a lighter layer of beds extending along the ridge, is Mississippian Arroyo Penasco Group. The Arroyo Pensasco Group includes the oldest fossil-bearing beds in northern New Mexico. Above these is a thin layer of tan sandstone beds of the Pennsylvanian Sandia Formation. The rest of the ridge is Pennsylvanian Madera Group limestone, with many impressive limestone beds standing out in the photograph. I turned around and hurried back, pausing only for a photograph of a Tertiary dike north of the village. and of Espinaso Ridge, south of Budaghers. Espinaso Ridge is a remnant of a chain of volcanoes that erupted in the Oligocene, around 30 million years ago. 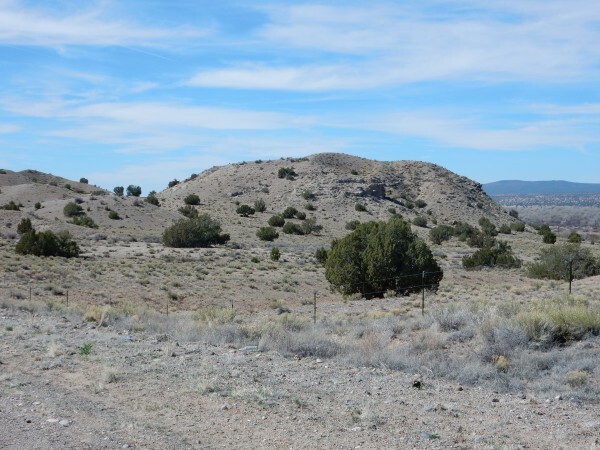 The volcanoes have mostly eroded away, leaving the Cerrillos Hills and the San Pedro Mountains as remnants of their interiors and Espinaso Ridge and some similar beds to the east as remnants of the sediments eroded off the volcanoes. Well, at least this shot will not be a problem to do over; it’s right along the interstate where I drive frequently. And home, almost precisely on time. I spent yesterday planting flowers for Cindy. She seemed pleased. It left me feeling a bit stiff today, but worth the effort. I’m still planning a proper birthday adventure for March 31, when I will be 55 years old. I haven’t settled yet on whether to take another crack at the orbicular granite, or climb Buckman Mesa, or try some other adventure. I suppose it may depend in part on whether a sturdy hiking partner turns up. Both trails are very popular, so I wouldn’t be precisely alone even going without a partner, but still.